Using pouched grain products is a great way of saving time in the kitchen, and this meal is a perfect example of how handy some store cupboard-standbys can be. Store leftover pilaf in the fridge for later. 1. Cut the cauliflower into small, bite-sized florets. Dice the courgette into similar sized pieces. 2. Cook the cauliflower florets in boiling water until just tender but retaining a slight ‘bite’. Drain. 3. Meanwhile, heat a griddle pan to a med-high heat. Slice the tenderloin into pieces of about ½ inch thickness. Rub lightly with a little olive oil and add to the griddle. Cook for about 3 minutes each side, then set aside to rest while you finish the pilaf. 4. Heat a little more olive oil (or coconut oil, if you have it) in another pan on medium heat. Add the courgette and cook for 2-3 minutes until lightly softened. 5. Add the cauliflower and the tomato paste and cook, stirring, for 3-5 minutes. Stir in the rice/grain pouch and the peas, and continue stirring until heated through. 6. Stir through the herb/s and serve alongside the tenderloin. The recipe’s featured ingredient, cauliflower, is a good source of vitamin K, which plays an important role in bone building, as well as helping to prevent heart disease, in addition to a variety of other roles throughout your bodily processes. Lean pork is a good source of proteins, minerals and vitamins. It has a low sodium content which makes it an intelligent choice for maintaining healthy blood pressure. Cauliflower ranks up there in the top 20 ANDI foods – in plain English, this is the Aggregate Nutrient Density Index – this means that cauliflowers contain the top amounts of minerals, vitamins and phyto-nutrient content, in proportion to the calories. 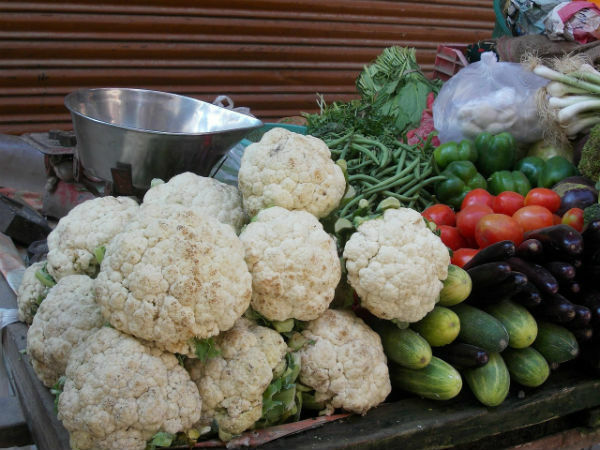 Cauliflower has Vitamin K that can help you build strong bones. The choline in cauliflower benefits your memory, while also helping with muscle movement, sleep and learning. Its high water and fibre content makes it an aid to digestion, and it may even help reduce the risk of cancers, including colon cancer.